I LOVE Christmas Morning! Each Christmas, our little family has a special breakfast with just us 6 after opening presents. After the kids go to bed on Christmas Eve and after Santa leaves the presents, I set the table for breakfast. I bring out our Christmas plates, glasses and mugs! My kids LOVE eating on our “Christmas Tree” plates. 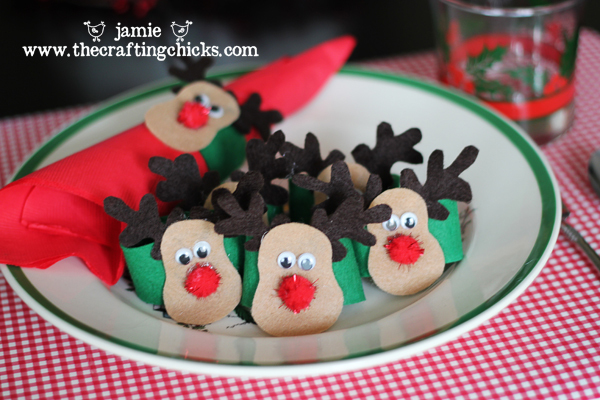 This year I saw some adorable felt reindeer napkin rings at a local craft store and thought…hey I could make these!…and so I did. 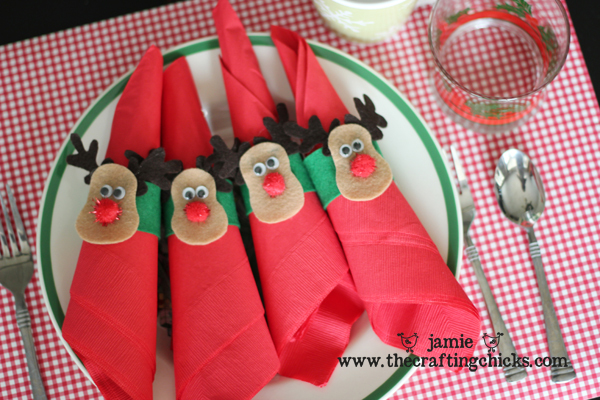 So this year we will add these cute little guys to our festive Christmas morning breakfast table decor. First you will cut out the reindeer parts. I just cut one out and then used it as my pattern. The antlers were a bit tricky, but remember it doesn’t have to be perfect. The green ring part was about 1 1/2 inch wide and 4 inches long and hot glued into a ring. Then I hot glued the antlers on the back of the reindeer head and glued the head to the ring. 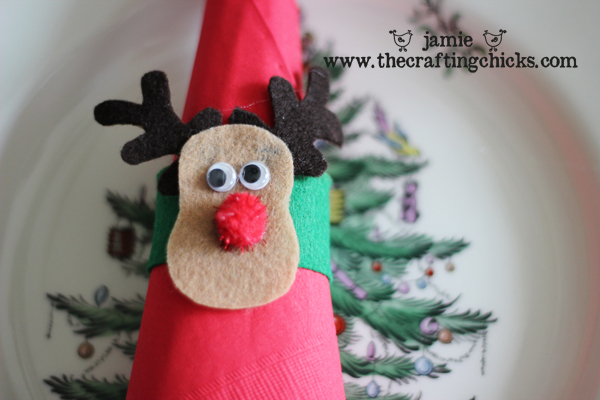 I then added google eyes and a red rudolph pom pom ball nose. And there you have some very cute napkin rings that your kids…or anyone will love! Now that your table is cute and ready to go…on to the breakfast. I don’t want to spend Christmas morning cooking in the kitchen, so I love dishes that I can make ahead of time or something I can throw together quickly and pop in the oven right before we open presents. -A breakfast casserole (I’m on the hunt for a new one this year) any suggestions? I like being able to put the ingredients together the night before and then pop in the oven first thing. 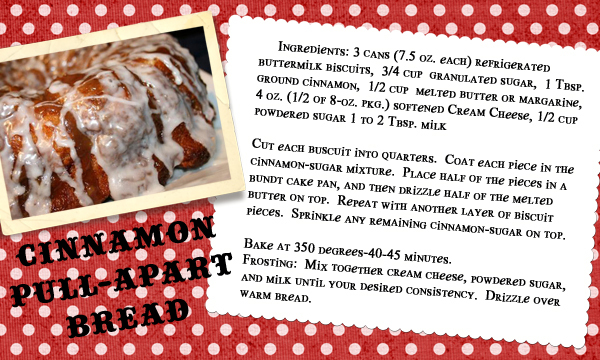 -& some cinnamon pull-apart bread (one of our favorites). It is so easy to throw together, makes your house smell yummy and is DELICIOUS! Hi Jamie! Here is a delicious recipe for a breakfast casserole thing. It is super easy, and I think it tastes better than those farmer breakfast things. I loved your idea about the Christmas breakfast! I have a really good breakfast casserole my family loves. Cressant rolls spread out in a 9X13 pan. Scrable 7 eggs, 1 cup shredded cheese, 1 cup bacon cooked and chopped, 1 small onion chopped and 1- 4 oz can of mild green chillies. Combine and pour in pan. Bake 375* for at least 30 min. mine takes a little longer depending on how much cheese I add that morning. Good Luck and Merry Christmas. If this doesn’t make sense e-mail me and I will scan the recipe card and e-mail it back. I love the mixture with the different cheeses and I love that you can make it ahead. So yummy!! I love this idea! We have awesome Christmas plates that we rarely use because we are always eating Christmas dinner elsewhere! I am definitely going to use them for our family breakfast this year! Super cute Jamie!!! I have been looking for something to make that morning too. 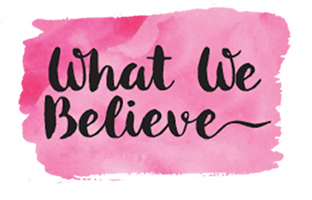 Love all these ideas! We do the same thing @ my in-laws’ house. This year we are having breakfast burritos, cinnamon pull apart bread, oj, hot coco, etc. 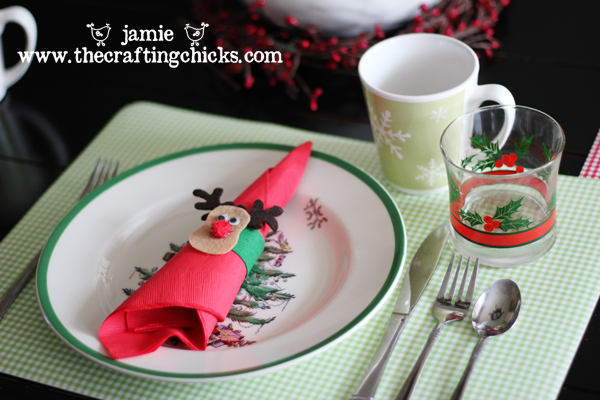 My Mom-b-law has similar Christmas plates, I just might have to make these napkin rings to go with them. Merry Christmas. These napkin rings are just too adorable! I’ll be on the lookout for some googly eyes now! I think I’m going to do a french toast casserole this year with blueberries. You prepare it the night before, and just pop it in the oven in the morning. Thank you ladies for all of your awesome ideas and recipes! I LOVE them all! This was the BEST POST EVER! 🙂 I am in love with those napkin rings, and the recipe sounds absolutely heavenly! Thank you for sharing!